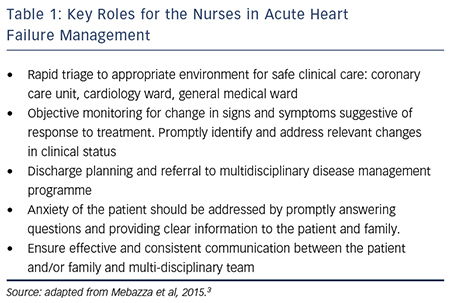 The key roles for the nurse in the management of heart failure have largely focused on the follow up and monitoring of patients at high risk of hospital (re)admission. Studies reported an improvement in outcome for patients followed up by a multidisciplinary care team in which a nurse was a key player. Such level of care is now recognised in international guidelines. 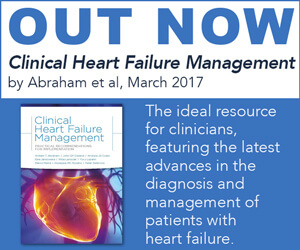 More recent emphasis on the management of acute heart failure has led to a focus on the contribution by nurses to the entire heart failure journey and their roles in improving patient outcome and the delivery of quality care. 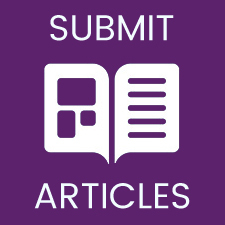 This paper focuses on the in-patient admission for acute or decompensated heart failure and discusses the involvement of nurses in achieving an effective heart failure service. The author has received honoraria for advisory boards and lecture fees from Novartis, LZ Pharma and Flora unrelated to this article. From a patient perspective, the acute heart failure journey generally starts with increasing shortness of breath, sometimes accompanied by non-specific signs and symptoms of oedema, fatigue, loss of appetite and changes in weight. Patients seek professional help when their own self-care resources fail or through the encouragement of family or friends. For some, the onset of symptoms is rapid.4 Either way, patients generally have worsening shortness of breath when they present to a hospital emergency department. The UK National Heart Failure Audit provides a detailed picture of the patient admitted to hospital. It reports that almost 80 % of those admitted to hospital with acute or decompensated heart failure present with shortness of breath on at least moderate exercise during their first hospital admission: New York Heart Association (NYHA) III 44 %, NYHA IV 35 %. At subsequent hospitalisations, the proportion of patients presenting with severe shortness of breath increases modestly: NYHA III 44 %, NYHA IV,40 %.5 On arrival in the emergency department, prompt recognition, management and transfer to an appropriate environment for care are necessary to alleviate both the physical and emotional symptoms of breathlessness and optimise outcome. 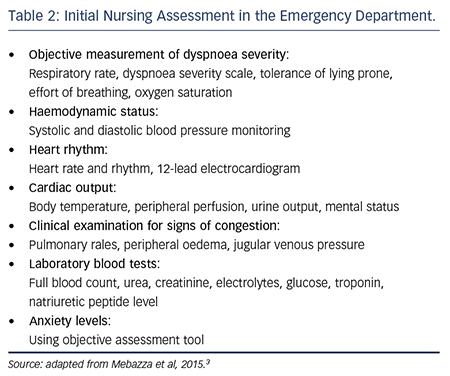 Unlike the focus on triage of the patient presenting with acute-onset chest pain, emergency departments do not generally have an acute heart failure triage nurse. Therefore the initial patient triage is frequently undertaken by a nurse practitioner who elicits the patient history, assesses the severity of the clinical status and refers to the relevant team. In this way, such nurses play a key role within the multi-professional team by helping to distinguish the cause of breathlessness and initiating prompt symptom relieving therapy. Key issues in the nurse’s initial clinical assessment of suspected acute heart failure are summarised in Table 2 and adapted from the most recent recommendations on management.3 Nurse practitioners generally have an ‘expanded’ skill set that enables them to also perform clinical examination to identify signs of congestion and refer for chest X-ray. Identifying clinical stability is an important first step in triage and enables the prompt transfer of the patient to the appropriate level of care for safe and effective therapy. This is largely influenced by the local organisation of services and skill sets of ward nurses. However, a patient at high risk of clinical deterioration or one requiring invasive cardiopulmonary support should ideally be transferred to the emergency resuscitation area, or an intensive or coronary care unit offering a lower patient-to-nurse ratio, closer patient monitoring and medical staff more available to support decision making. The management of acute breathlessness or cardiopulmonary instability is generally carried out simultaneously with diagnosis. Once the diagnosis of acute heart failure is made, diuretics are administered to relieve dyspnoea. Ideally the dose should be the lowest needed to reduce fluid congestion and so balance the positive action with any potential negative effect on renal function. Close monitoring of renal function, fluid balance and urine output are therefore needed. There is often a tendency to assume urinary catheterisation for the close monitoring of urine output. However, urinary tract infection attributed to urinary catheterisation is the most frequent cause of hospitalacquired infection and in acute hospitals may account for as many as 20 % of all hospital-acquired infections. Risk increases the longer a catheter is in situ, with a daily risk estimated as between 3–7 %.6 This risk is likely to be increased further in the older adult with more health problems. The consequences of such an infection are likely to vary, increasing the risk of a prolonged hospital stay and the development of in-hospital confusion, particularly in older adults. Alongside nursing actions to prevent infection, good practice also includes limiting the use of urinary catheters and, when they are necessary, removal as soon as possible. National and international guidelines suggest best practice in their use.7,8 In the context of acute heart failure this guidance can be interpreted to suggest urinary catheterisation should be restricted to those patients with cardiopulmonary instability and low cardiac output, when hourly urine output monitoring is needed. Within the context of heart failure the UK National Heart Failure audit revealed that in-hospital mortality is lower when patient care is managed in specialist cardiology wards rather than general medical wards (7.8 % versus 13.2 %).5 Taken together these papers suggest that outcome is improved when in-patient care is provided by a specialised team and by ward nurses familiar with the management of heart failure. Countries will need to decide locally how to interpret and implement these findings but they point to an association between the quality of nursing care and patient outcome. The in-patient hospital stay allows review of all medication, as well as combinations that may increase the risk of side effects. The in-patient admission also provides time for the safe introduction of new heart failure medication and this is likely to be slower in the older patient. When accompanied by close monitoring of physiological variables and assessment of the patient’s ability to manage potential effects, such as lower systolic blood pressure or increased diuresis, the in-patient stay can increase the safe prescription of medication, as well as positively influence patient compliance. For example, nurses can remind patients to stand up slowly to reduce their risk of dizziness and falls, teach them to modify the timing of diuretics to enable activities outside the home and facilitate the supply of continence aids when necessary. Where in-patient care is not provided on a cardiology ward this can be facilitated by regular outreach by the heart failure team and the heart failure specialist nurse has a central role in this, providing advice, education and liaison between the health-care teams directly involved in providing care and the heart failure specialist team. 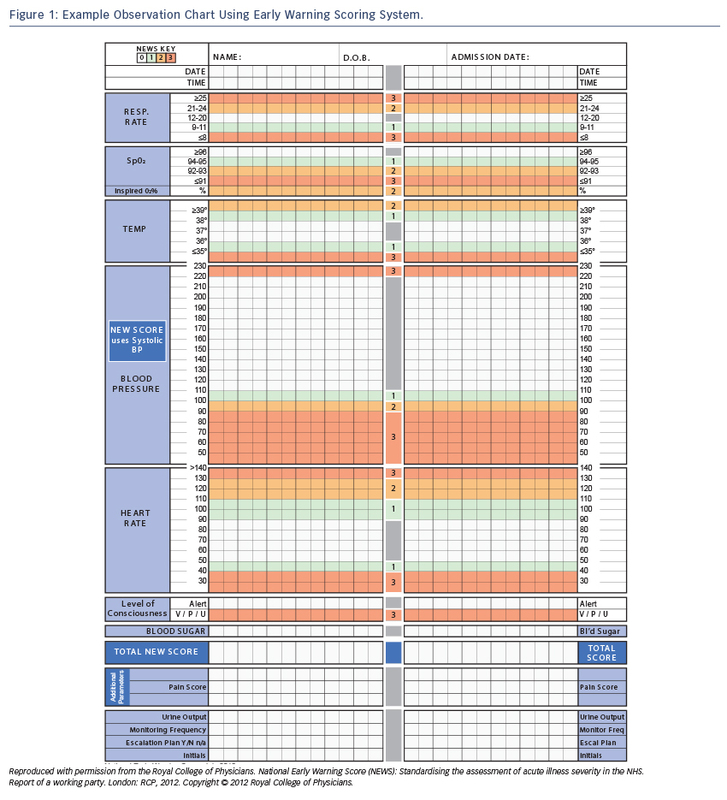 Discharge planning commences once the patient is stabilised and discussions include the heart failure specialist team, the patient and, where necessary, the patient’s family. Preparing for discharge requires assessment of social environment into which the patient will be discharged as well as their capacity to self-care. Patients admitted to hospital with heart failure are frequently elderly with multiple comorbidities. They have reduced physiological reserve to adapt to change and stress and may require a period of rehabilitation and supportive community resources in the initial post-discharge phase. In such situations the heart failure nurse co-ordinates discussions to develop a collaborative discharge plan. In a quasi-experimental study in Sweden of 248 elderly patients hospitalised with heart failure Ulin and colleagues report an earlier hospital discharge in patients whose discharge plan was a collaborative process between the heart failure team and social/community team. They report a mean of 6.7 in-hospital bed days compared with 9.2 days in patients who did not receive a co-ordinated discharge plan.14 Such an approach may have particular advantage when hospital discharge is delayed due to social circumstances. Regardless of age, discharge from hospital is frequently cited as a period of high anxiety for both patients and their families. A coordinated care plan that estimates time to euvolamia and commencement of heart failure medication can be communicated and discussed at an early stage and so help prepare both the patient and their family for discharge. Results such as these point to the complexity of providing the patient with education for self-care and are recognised in the current focus on individualising patient education. A patient’s capacity to learn and retain new information may be reduced whilst hospitalised, in part due to higher levels of anxiety and cognitive dysfunction. It is therefore good practice to use the hospital admission to provide the patient with verbal information that is supported by written material. Some nurses use the ‘teach-back technique’ whereby they ask the patient to repeat, using their own words, the information they have given them.17 This enables the patient to confirm their understanding and the nurse to rephrase any information that is misunderstood. Such a technique involves the nurse and patient in the repetition of information and increases the time the nurse spends with the patient discussing heart failure and its management. It is possible that this increased time spent in patient education provides benefit in terms of knowledge retention and may be particularly valuable when interacting with the person with low educational or health literacy. Both the education provided and the patient’s understanding should be communicated to the heart failure disease management team and should form a basis for ongoing education and support. Mortality is high in patents discharged from hospital following an acute heart failure admission. Despite advances in care about 14 % of patients still die within six months of hospital discharge.18 Various factors are likely to increase this risk such as age, frailty, number of hospital admissions in the preceding 12 months and presence of cachexia.2 The hospital admission provides time to identify patients with a worse prognosis and introduce palliative and supportive measures. Such care actions include providing pain relief, discussions around future care planning and preferred place of death. There is a growing recognition of the need for such discussions and hospitals increasingly provide a palliative care service jointly between the heart failure and palliative care nurse. Where such services exist studies report a reduction in symptom burden and depression and improvements in quality of life.19 Such services also report an increase in advance care planning.20 This may help address the currently reported mismatch between patients’ preferred and actual place of death. Patients with acute heart failure benefit from early diagnosis, close monitoring and management provided by skilled heart failure teams that include a heart failure nurse specialist and by cardiology ward nurses with sufficient education to support safe practice. As part of the team, the heart failure nurse specialist is well placed to also provide an outreach service to patients throughout the acute heart failure pathway and this requires close collaboration with nurses in non-cardiology specialist areas such as the emergency department and general medical/care-of-the-elderly wards. In contrast to the evidence base to support the heart failure nurse in long-term disease management, the nurse’s role in the acute heart failure pathway is less clearly defined. We now need to turn our attention to this in-patient period and strengthen the evidence that supports the role, number and skill set required of nurses to underpin effective heart failure treatment throughout the entire patient journey. McAlister FA, Stewart S, Ferrua S, McMurray J. Multidisciplinary strategies for the management of heart failure patients at high risk for admission. A systematic review of randomized trials. J Am Coll Cardiol 2004;44:810–9. McMurray JJV, Adamopoulos S, Anker SD, et al. ESC guidelines for the diagnosis and treatment of acute heart failure 2012. Eur Heart J 2012;33:1787–1847. Mebazaa AM, Yilmaz B, Levy P, et al. Recommendations on pre-hospital and early hospital management of acute heart failure: a consensus paper from the Heart Failure Association of the European Society of Cardiology, the European Society of Emergency Medicine and the Society of Academic Emergency Medicine. Eur J Heart Fail 2015;17:544– 558. Riley JP, Ggabe JPN, Cowie MR. Does telemonitoring in heart failure empower patients for self-care? A qualitative study. J Clin N 2013;22:2444–55. Gould CV, Umscheid CA, Agarwal RK, et al. Guideline for prevention of catheter-associated urinary tract infections 2009. Infect Control Hosp Epidemiol 2010;31:319–26. Royal College of Physicians. National Early Warning Score (NEWS): Standardising the assessment of acute illness severity in the NHS. Report of a working party. London: RCP 2012. Smith GB, Prytherch DR, Meredith P, et al. The ability of the National Early Warning Score (NEWS) to discriminate patients at risk of early cardiac arrest, unanticipated intensive care unit admission, and death. Resuscitation 2013;84:465–470. Aiken LH, Sloane DM, Bruynell L et al. Nurse staffing and education and hospital mortality in nine European countries: a retrospective observational study. Lancet 2014;383:1824–30. Cowie MR, Bell D, Butler J, et al. (2013) Acute heart failure–a call to action. Br J Cardiol 2013;20(Suppl 2):S1–S11. Seferovic PM, Stoerk S, Filippatos G, et al. Committee of National Heart Failure Societies or Working Groups of the Heart Failure Association of the European Society of Cardiology. Organization of heart failure management in European Society of Cardiology member countries: survey of the Heart Failure Association of the European Society of Cardiology in collaboration with the Heart Failure National Societies/Working Groups. Eur J Heart Fail 2013;15:947. Ulin K, Olsson L, Wolf A, Ekman I. Person-centred care – an approach that improves the discharge process. Eur J Cardiovasc Nurs 2015;17:1–8. Lainscak M, Cleland JG, Lenzen MJ et al. Nonpharmacologic measures and drug compliance in patients with heart failure: data from the EuroHeart Failure Survey. Eur J Heart Fail 2007;9:1095–103. Ekman I, Andreson G, Boman K et al. Adherence and perceptions of medication in patients with chronic heart failure in patients during a five-year randomised controlled trial. Patient Educ Couns 2006;61:348–53. White M, Garbez R, Carroll M, et al. Is “teach-back” associated with knowledge retention and hospital readmission in hospitalized heart failure patients? J Cardiovasc Nurs 2013;28:137–146. Mehta PA, Dubrey SW, McIntyre HF, et al. (2009) Improving survival in the six months after diagnosis of heart failure in the past decade: population-based data from the UK. Heart 2009;95:1851–6. Bränström M, Boman K. Effect of person-centred and integrated chronic heart failure and palliative home care. PREFER: a randomised controlled study. Eur J Heart Fail 2014;16:1142–51. Jorgenson A, Sidebottom AC, Richards H, Kirven J. (2015) A Description of Inpatient Palliative Care Actions for Patients with Acute Heart Failure. Am J Hosp Palliat Care 2015:epub ahead of print.